In Docker, it is common to have container agents that add functionality to your Docker deployment. We will borrow from this concept and build a Lambda registrar agent that will manage the registration and monitoring of a service. """Checking component status of REST API.""" """Lambda hander for agent service registration.""" If all of the parts are there, the service is considered healthy. The register function is called with the service information and a healthy status. If only some of the parts are there, the service is considered unhealthy. The register function is called with the service information and an unhealthy status. If none of the parts are there, the service is considered to have been removed. The deregister function is called, and the Lambda agent will delete itself because it is no longer needed. Subsequent register function calls will overwrite the information, so as the health status of our services changes, we can call the function repeatedly. In fact, when we deploy the agent with our Hello World service, we will show how to put the Lambda registrar agent on a five-minute schedule to continuously monitor our service. Now we are ready to pull everything we have done in this blog series together: we will deploy this service with a Lambda registrar agent that registers and deregisters it with our serverless discovery service. First, we need to add the requests Python module to the directory we are deploying from because our Lambda registrar agent is dependent on it. After we have deployed the Hello World service, we create a JSON file (service_properties.json) with some of the outputs from that deployment. This JSON file is packaged with the Lambda registrar agent. We have implemented a fairly simple but functional discovery service without provisioning any servers or containers. We can build on this by adding more advanced monitoring, circuit breakers, caching, additional protocols for discovery, etc. By providing a stable host name for our discovery service (instead of the one generated by API Gateway), we can make that a central part of our microservices architecture. 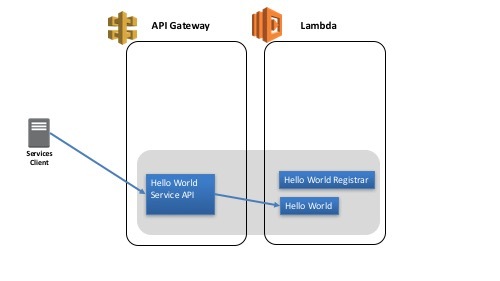 We showed how to use Amazon API Gateway and AWS Lambda to build a discovery service using Python, but the approach is general. It should work for other services you want to build. The examples provided for creating and updating the services can be enhanced and integrated into any CI/CD platforms to create a fully automated deployment pipeline.